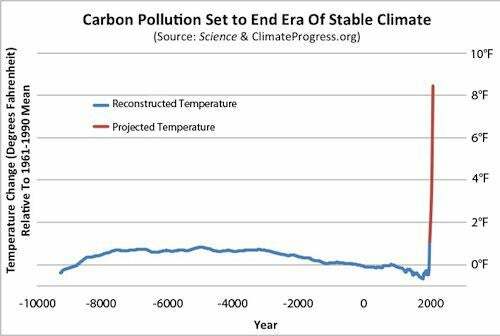 Global warming: New study shows warming is faster than it has been in 11,000 years. Let’s get that out of the way right at the start. Climatologist Michael Mann’s bombshell study from years back created the “hockey stick” graph, showing that in the past century, the Earth’s overall temperature spiked, like a case of planetary flu. This study was immediately attacked by climate change deniers, who continue to flail away at it today. It has withstood these attacks, and is no longer seriously doubted by scientists who actually study the climate. 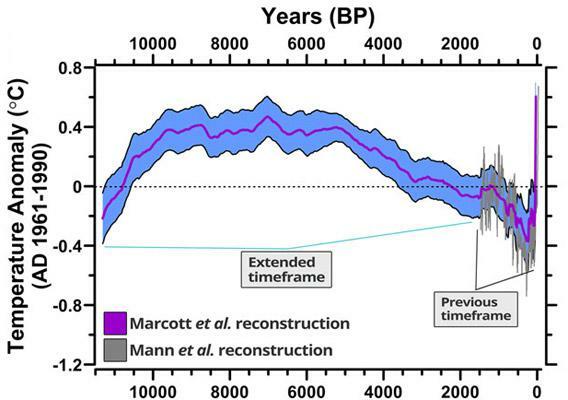 The reconstructed global temperature anomaly for the past 11,000 years. The Earth was warm (and warming) in the past, then started to cool…until the last century. And now, a new study shows that this spike in temperatures is unprecedented going back over one hundred centuries. They looked at global temperature anomalies—deviations from an average or standard temperature—for 73 sites distributed across the planet, using fossils in sediments as a proxy for temperature. The chemical and isotopic composition of the fossils yields a fairly accurate measure of the environment temperature at the time the animal or plant making up the fossil lived. What they found is simply stunning: The rate at which the globe is warming right now is far, far faster than it ever has going back as far as they could measure, up to 11,300 years ago. In fact, over the past 5000 years, the Earth actually cooled by about 1.3°F…until the last 100 years, when our temperature spiked upwards by about the same amount. Mind you, this is the rate of warming, how quickly the global temperature is increasing. But they also showed the actual temperature of the planet is warmer now than it has been for 70-80 percent of the past over that time period. There have been times when the Earth was warmer, but the important point isn’t the actual temperature, but what it’s doing. And what it’s doing now is skyrocketing. The global temperature anomaly projected into the future shows we’re in for trouble, a lot more than we have now. The predicted ~8° F rise is not a joke, nor is it some sort of exaggeration for effect. It’s the result of several studies showing just how much human activity is affecting our planet. We’re pumping 30 billion tons of CO2 into the atmosphere every year—100 times as much as all volcanoes combined—and all that carbon dioxide is upsetting the heat balance in our atmosphere. We retain more of the heat from sunlight, and that warms us up. It’s really that simple, despite the frothing from the deny-o-sphere. And of course, the usual suspects are already trying to decry this new study, but as they always do they have to resort to twisting reality into a Möbius strip. But this is nothing new when it comes to denier claims. Their methods are always the same: cherry-picking data that supports their argument but ignores huge amounts of evidence refuting them, displaying misleading graphs, and out-and-out witch hunts and attacks. If you can’t attack the science, don’t worry, just keep attacking anyway. The bottom line here is the same as it has been for a long, long time: The planet is warming up. The rate at which the temperature is rising took a huge leap starting a century ago, and it’s due to human activity. We’re seeing the effects now, from the ice caps melting to changes in vegetation growth rates. There is no scientific controversy here, just a manufactured political and ideological one. And if we don’t accept that and start working toward a solution, now, there won’t be much need to argue any more.